Coretech is designed for Oil Exploration and Coring companies who are frustrated with inefficient data collection, cumbersome paper-based reports and a lack of real time project updated in the coring industry. Unlike the manual process, which has a high probability of human error, our Core Management System collects and retains your coring data and provides your organization with a visual advantage regarding your entire coring process? 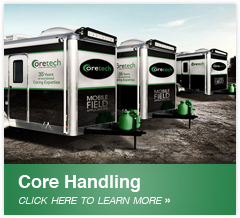 Coretech is the center of your operations and was specifically designed to bring added value to your coring operations. The Core Management System puts the power of technology and information at your fingertips that brings a standardized process which increases your overall Quality Assurance. When the Core Management System is linked with the Web portal and Mobile site, Coretech can link your entire team like the rig manager and Coring Units, Geologist, Core laboratories, Management and Oil Companies together on a secure data network. Difficulty in determining offsets – difficult to manually access historical data for analysis. Correlation of core logs – depths, recoveries and incidents – are poorly transcribed to the laboratory. Communication between the operator, contractor, the rig and the laboratory is cumbersome and has a considerable lag time. High probability of human error – error filled excel sheets and hand marked core tubes. One time data entry, greatly minimizes human errors due to transcribing of data. Accurate project info such as Correlation of core logs – depths, recoveries and incidents. Real time* updates regarding the coring process such as Pipe Tally, Total Meters Cut and Recovered, and memos. Cost efficient – reduced human resources and management time for project updates. Many Drilling and Coring Rigs operate in areas without reliable or consistent internet service, so Coretech was engineered for both online and off-line capability. Core Management System can function with or without Internet connectivity. When operating in the offline mode, Coretech will continue to function and record the coring process and will store the data in a holding queue until an Internet access is resumed. When the system identifies internet capability, Coretech will auto-sync with the data network for sharing on the Web Portal and Mobile devices.